One of government’s fundamental responsibilities is to protect the health, safety, and welfare of the citizens it serves. Yet, four diseases (heart disease and stroke, cancer, type 2 diabetes, lung disease) result in more than 50 percent of deaths in San Diego County. Poor diet is a major risk factor with all three of these diseases and a major driver of unhealthy weight gain. In an effort to protect public health, safety, and welfare, jurisdictions across the nation are looking to understand and address contributing factors to chronic disease. 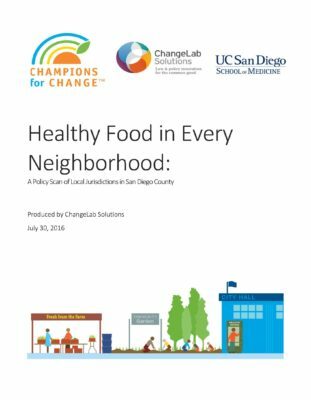 Healthy Food in Every Neighborhood: A Policy Scan of Local Jurisdictions in San Diego County is produced by ChangeLab Solutions in partnership with the University of California, San Diego Center for Community Health. The report identifies three key policy strategies, farmers’ markets, community agriculture, and healthy government procurement policies, jurisdictions can deploy to improve the environment in which people purchase food. The report reviews general plan and municipal code policies in all 18 incorporated cities within San Diego County, as well as the County of San Diego (19 jurisdictions in total). This tool is intended to stimulate discussion about different policy options for improving healthy food access across San Diego County, especially in underserved neighborhoods.